Hot legs. A sleek light walnut tripod base suits a variety of settings from contemporary, masculine, transitional to loft style. The legs attach to a metal disc that supports the socket and white textured linen shade. Overall height is 63 in. and the tripod base has a 17 in. footprint. Lamping is a 150-Watt 3-way incandescent or 3-way CFL bulb. 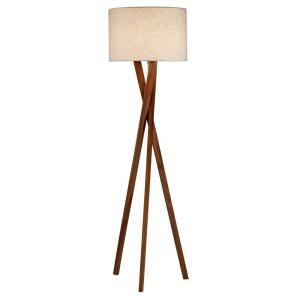 Available in a matching table lamp to complete your room's look. Tbook.com crawls the web to find the best prices and availability on Lamps and related Tools and Hardware products like Adesso Brooklyn 63 inch Walnut Floor Lamp. For this page, related items include products we find that match the following keywords: "Lamp" at our vendor partner Home Depot. Adesso Brooklyn 63 inch Walnut Floor Lamp is one of 143 Lamps and related products listed in the Tools and Hardware section of Tbook.com If you have any questions on this product, please give us a call at 734-971-1210 during the hours of 9am - 5pm EST for assistance. Thank you for shopping at Tbook.com, the Internet Department Store!